The genus Zela comprises some very rare species of Hesperiidae in the Malaysian and Singaporean butterfly fauna. The caterpillars of the genus typically feed on rattan. 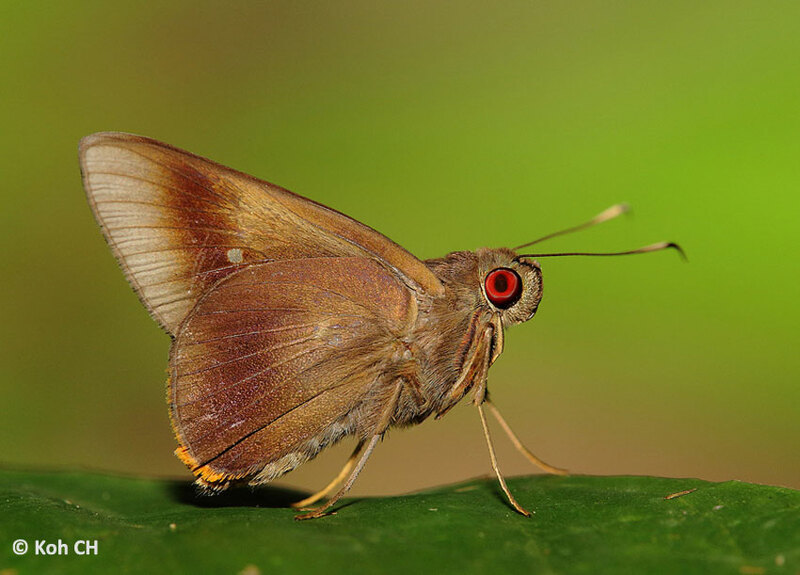 The only representative found in Singapore so far, Storey's Palmer (Zela storeyi) was a recently revised taxon that was previously classified as Zela zenon. It was described and re-classified in 2004 by Dr Laurence Kirton and the late Col John Eliot, in the Malayan Nature Journal. The species was named in honour of the famous collector, Hugh RM Storey, who did most of his collection in Malaysia until he passed away in April 2002. What was fascinating about HRM Storey, was that in the later years of his life, he was collecting butterflies in the field whilst confined to a wheelchair! Veteran Malaysian collectors will remember that Hugh led the group of prominent butterfly collectors and researchers known as the ToshForce. This excellent shot of Storey's Palmer was taken last weekend by ButterflyCircle member, Koh Cher Hern in a patch of forest within the nature reserves where this species is most often encountered.